My boyfriend, the gamer nerd (love ya Honeybear) informed me about a week ago that rumors of a World of Warcraft movie have been circulating for a while. No conclusive information had been found. Until now. Director Duncan Jones (aka Zowie Bowie) is going to direct a World of Warcraft movie. 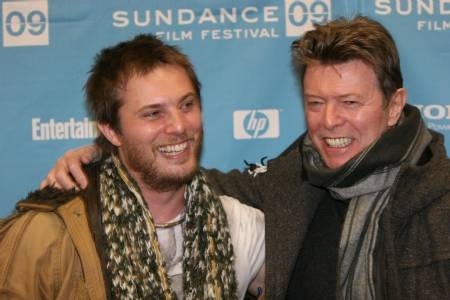 Duncan Jones and proud father. Love those smiles. A friend of mine (Wyatt Kane, who has been mentioned in my blog before) sent me this link a while back: Duncan Jones tapped to direct 'World of Warcraft' movie. It seemed plans for this movie were in motion. Then I found this on davidbowie.com: Duncan Jones to direct Warcraft movie. Apparently it was made official a few weeks after David Bowie announced the release of his new album. Here is a good, informative article about the coming film: 'Warcraft' Movie Lands 'Source Code' Director. The plan is for the movie to be released in the fall of 2015. I have no notion what the movie will be about (having never played the game myself) and they are keeping the script under wraps. From what I have heard from Isaac, there are lots of aspects to the game. I can't imagine they can capture everything in a movie. I have been obsessed with David Bowie for many years now and I have plenty of useless DB facts rolling around in my head. I never did much research on the rest of his family. From what I have read, I didn't much care for his first wife (nor of their open marriage, but had I met DB back then, I would have hated him, I think) and I love his second (and current) wife, Iman. I know that he and Iman had a daughter in 2000 and I knew about Duncan Jones (and Iman's child from her first? second? marriage--is she on number three? I think so). Now that I have been researching Duncan Jones, I have found that he is amazing in his own right and I think I will do some more research and have some blog posts about him. Not just about this and his other movies (none of which I've seen), but about his life and the things he does that are great for others. So, to be continued, eh?